Even without a thorough knowledge of white sage’s (Saliva apiana) mystical characteristics, simple observation of the plant will impress upon the onlooker a profound sense of respect and reverence. Its long, grey-green leaves are covered with hundreds of soft, silvery hairs and emit a powerful, earthy smell. In the right light, white sage almost shimmers, and when in bloom, white or pale purple flowers erupt from stalks that can reach several feet in height. 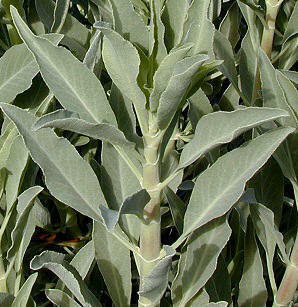 White sage tends to grow in full sun, in dusty or rocky soil, and is extremely drought resistant. White sage (we’wey) has been used by the Chumash for thousands of years in order to primarily heal the spirit, which they believe in turn aids in the body’s ability to recover. When smudged, the smoke is used to purify the patient’s central nervous system and calm the psyche. Smudging is typically used with prayer and formal ritual, but a constant dose of sage and its benevolent properties can be ensured every day by maintaining gardens where the plant holds a prominent position. During blessings, the smoke from white sage is said to bring prayers to God and invite divine benevolence into the healing process. Leaves can be collected in conjunction with prayer to create a tea or placed directly in the mouth to soothe sore throats. Sage contains cineole, which is an anti-inflammatory, as well as active diterpenoids, which are compounds that have been shown to combat bacterial infections, and reduce allergy symptoms. White sage can also be added to a sweat bath, used to treat fevers, made into a poultice, and ingested to aid in the treatment of ulcers. Bambu Batu is now fortunate to have bundles of sage available in the store. Wild-crafted from the hills behind Big Sur, the leaves are ready for smudging or to be made into infusions. Continue a tradition of healing and blessings with this remarkable plant!